Brown rice, red quinoa, turmeric sweet potatoes, lightly dressed arugula, a poached egg, pistachios, and lemon herb dressing. This is The Bowl Life. When did this concept of bowls come on the scene, anyway? All is know is that sometime between maybe last year and this very moment I’ve become completely obsessed with the idea and practice of piling a bunch of foods in a bowl and calling it all fun bowl names. Oooh I know let’s have Bangkok Curry Bowls tonight! or omgosh SO CRAVING a Mediterranean Quinoa Bowl! or Netflix + Healing Bowls tonight, for sure. I feel like it’s the millennial version of the casserole. The only thing about bowls is that how do you make them if you are feeding a crowd? crowd as in family? I mean, I think you just make everything separately and let people kind of build their own bowls? Maybe? I only feed two people in my family so I’m not sure how these things work. Are bowls are sort of limiting in terms of who they’re practical for? Tell me what you think, wise readers who have families larger than two people. In the meantime, all of us Cooking For One or Two peeps shall be over here assembling and devouring bowls bowls bowls more bowlssss! And I shall be working on creating a category on POY for Bowls, because I just went to categorize this recipe and it is not a salad, friends. Not a salad at all. The Healing Bowl situation today is epically beautiful and nutritious. We’re doing a quick steam + mash of sweet potatoes in a skillet. Adding turmeric because these are healing bowls and we need our power spices for times like these. We’re whirring up an addicting batch of lemon herb dressing in about 5 seconds flat THANK U BLENDER. We’re throwing some cooked brown rice and red quinoa in the bowl and feeling a moment of intense gratitude for the time-saving product that is bulk packages of Seeds of Change fully cooked whole grain products that they sell at Costco. Just saying. We’re arranging the sweet potatoes and the arugula over the brown rice and red quinoa in the bowl, and maybe revisiting the fridge for any last minute additions to the club, and then kind of just letting it all happily soak in some of that lemon herb dressing. It’s bright and snappy and you’re going to be tempted to eat it at this point but WAIT – THE EGG. And finally, we’re done. We sit down to a bowl of nutritious and colorful slow food that is so filling and so packed with flavor that we wonder how we will ever eat anything else for dinner ever again. Is this not the ultimate power food combo? Major s/o to turmeric, sweet potatoes, arugula, brown rice, red quinoa, eggs, and garlicky lemon herb dressing. So. Much. Love. Healing Bowls: turmeric sweet potatoes, brown rice, red quinoa, arugula, poached egg, lemon dressing. BOWLS: Toss the greens with a little dressing. You can also stir a little dressing into the sweet potatoes – that’s yummy. Serve each bowl with the mashed sweet potatoes, brown rice, greens, and a scrambled or poached or fried egg. Top with more dressing and a handful of pistachios. This makes enough for 4 servings of mashed potatoes and dressing. Not including nutrition facts on this one because it’s so varied based on how you build your bowl – what whole grains you use, how much dressing, etc. LOVE the bowl! Was this handmade or from a shop? It’s actually made by Lindsay’s father-in-law! This is what I call BEAUTIFUL FOOD! Have not made any of this deliciousness yet but just had to tell you how in love with this bowl I am. There is something so soothing and comforting about food served in a bowl. You have captured the best of the South, thrown in a gourmet spin, packed with flavor and goodness…sheer genius. yum yum!!! I am making this for dinner tomorrow night!! 🙂 I just have to ask though… where did you get that goregous bowl?! I have been looking for similar ones for a long time!! oops just read the other comments!! is “Lindsay’s father in law” selling any online? Just tried this for lunch and it was amazing! I am always looking for fun ways to use tumeric. I added avocado to the bowl as well, just because I love avocado, so why not… it was delicious! We usually feel pretty “Why not! ?” about avocado too. 🙂 Glad you enjoyed it! This was amazing. However, I was vegan for three years, and just ruined two eggs trying to do this. Will definitely try more of your recipes! Glad you enjoyed it, Alison! This looks lovely. And yes, with a big family, I’d definitely let folks assemble their own bowls. Maybe even cook their own egg, because egg-cooking is SUCH personal thing. I just made this healing bowl for dinner and it was delicious and easy! I am hooked! The balance of flavors is wonderful and it’s super comforting and filling. After a weekend of pizza and junk food I needed to reset and not feel super gross. I’m so glad I found this recipe and I can’t wait to make it again! Where are those bowls from? They are gorgeous! This is one of the yummiest things I have eaten in a long time – so full of flavour and nourishing! Thank you!! Seriously this is so delicious. I was skeptical half way through the prep but I powered through just to try the poached egg technique – works perfectly with the larger ring size. Love it!! I cubed the sweet potatoes tossed them with olive oil and turmeric salt &cracked pepper & roasted them – it worked well not a mashed sweet potato fan. So excited that 2 tsp of turmeric just meld into the potatoes and even enhance them. Loved this so much my husband asked me to make it again today!! Thanks for a great recipe. Um cannot wait to try this! But quick question, I also LOVE the bowls you are serving it in..did you spin that or is there somewhere I can get one?? I came across your recipe on pinterest, and made it tonight for the flatties- it went down an absolute treat! 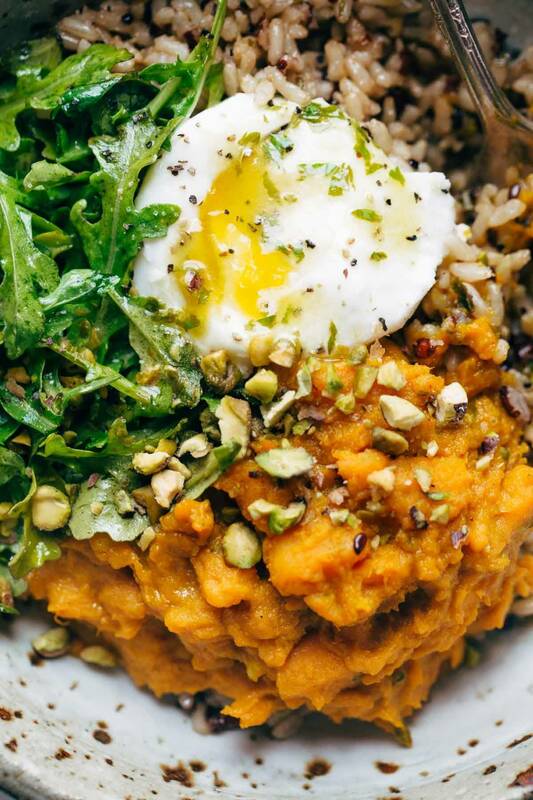 All our favourite things in one bowl, and we could not get enough of the mashed sweet potato with that dressing! Just divine – thanks!!! Hey Lindsay! LOVE this recipe! I found your awesome blog through Pinterest and will definitely become a proud follower! Thanks for sharing! We made this tonight and it was so good!! I just made it and it was delicious! I just made this recipe with a few substitutions: orange instead or lemon, spinach instead of arugala, & coconut milk instead of cream. Turned out amazing! Definently adding to my rotation! I LOVE a good bowl. I have to ask: WHERE did you get that incredible dish!? could you please let me know how many calories are in this? looks great, would love to add this into my meal prep, but I am trying to track my calorie intake. Thanks!! I made this this week and its wonderfully delicious! i bring it to lunch at work too but sub out the egg for baked tofu. I just made this tonight, easy wonderful bowl of goodness. Thank you for the recipe. 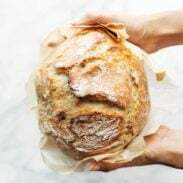 Great recipes and ideas! Thanks for sharing!